You know how parents are ultra embarrassing when you’re growing up? Maybe it’s their undying love of Birkenstocks, or when they try to say trendy things like “that’s cray” and “chillax” or even how they clip their toenails onto their plate after they finish eating. Well, at the ripe age of 28, I’ve come to the realization that this embarrassment never ends. It just evolves into something different. Mom: Blair, did you see this sign? Maybe you shouldn’t swim today. Me: Uh… I’m fine, mom. No diarrhea here. Mom: But, I saw you rush to the bathroom when I was getting water in the middle of the night. I just assumed it was urgent. Is everything working okay down there? Have you seen a doctor lately? Diarrhea can make you dehydrated. Make sure you drink more water today. Me: Thanks, mom. I’m good. Just a routine visit in the night. Mom: Do you remember that time you pooped in the bath tub when you were with your sister? I can think of a couple times you went in the water when you were little. I don’t know what it was… but, you liked to let loose once you hit water. I think it relaxed you. It was so weird. What’s more humiliating: my mom deciding to loudly discuss my issues in public, or the woman who was frantically pulling her kids out of the water while they were crying, thinking there was actually a possibility I would crap in there? Thanks for the vote of confidence, lady. I’m almost 30. 😂😂😂😂😂 I might just die!!! I love that show! I really thought it was something that would end as I got older…. But. Nope. Haha, oh no. My father-in-law is a huge movie buff and always asks my husband to go with him to the theater. He hates going because of a similar situation to yours. It’s hilarious. Loud movie talkers are funny — especially when it suddenly gets super quiet and they are all you can hear. Mortifying! Haha! FYI My mom is 80 now. It never stops. hahaha! my mother “stage whispers” that stuff and she might as well be screaming. So funny! When I got divorced, many years ago, my parents felt sorry for me. So they invited me on an endless round of visits to stately homes, old people’s tea parties – whatever they were doing I got included in. Which was nice, except my mother kept saying to every waitress, acquaintance or whatever, This is my daughter. She used to be married to an artist but now she’s DIVORCED. Yes, yes they do lol. She never learned that some things should remain private! it doesn’t end. i’m 38. my mom still buys me clothes, which is nice. but when it doesn’t fit, it’s a ten-minute bask “of course i should’ve gotten a bigger size.” [insert more references to weight mismanagement here]. in other news, i enjoyed your post! thank you! Oh, now that’s a low blow. That would bother me a lot more than my mom talking about my bathroom habits. Absolutely hilarious! Have just got to reblog you! The pool sign made me bust a gut! I’m mean, how would they know if you had the runs 14 days ago anyway? I was at my local suppermarket looking for 12 grain bread. The sign below the bread read: ‘Regular: $329. Now on sale for: $329!’ LOL! Sounds to me like someone was hitting the crack pipe. Bread…what in the world kind of bread is that. Someone has smoked something…..yikes. And now I get to do THAT to MY daughters! Woohoo!!! What fun! It’s the best… I absolutely love being a dad. You just made my day. That’s hilarious. How are your bowels, dear? I couldn’t resist. I’m still laughing about your experience. On the positive side, public humiliation always makes for good writing material. Seriously, this is hysterical! Pretty funny. Remember, this is the person who used to change your diaper. Wow, I think we might have the same mom. Lol! I’m a mother now. It’s my job to be embarrassing ( that’s what I tell my 11 yr old son anyway!) don’t forget that as you get older your hearing and eyesight goes, sometimes you don’t even know you are talking loudly…….. 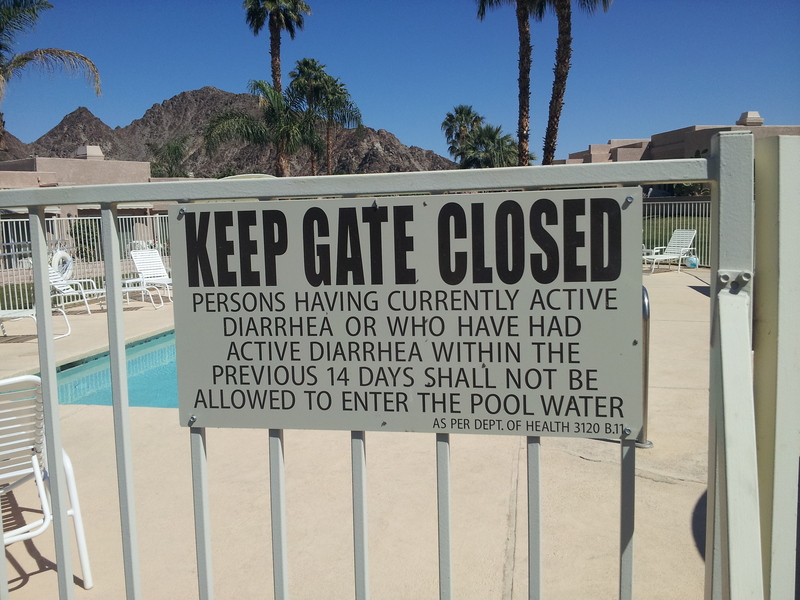 Funny story, also funny is that I just got home from there last night, that looks like the same pool where I was staying in Palm Desert, at least the sign is identical! Haha that’s a funny coincidence. I guess those signs are just the norm over there. I’ve never seen one anywhere else in the US before. I’m pretty sure that I embarrass my kids every time I open my mouth and speak. At least the looks on their faces seem to indicate that. 🙂 But that certainly doesn’t stop me from talking!! I think it’s a great idea for you mother to broadcast the history of your bowel movements to the nation. Then as a follow-up perhaps she can solicit the opinions of passers-by as to your possible diarrhea issues. I had to laugh! How do we all have the same moms? Haha, I love my mom. It would be hilarious to see her write about a time I’ve embarrassed HER. I’m sure it’s happened! That’s funny ! I remember in college when anyone’s parents would visit the kids in dorms and the person asking the 20 neighbors on left and right not to talk loudly, no smoking, no drinking, no swearing for those couple of hours. Haha, I could see my mom asking that. Hilarious. Hahahahaha oy my daily dose of amusement.